After years of development, we're proud to finally announce our final release date! 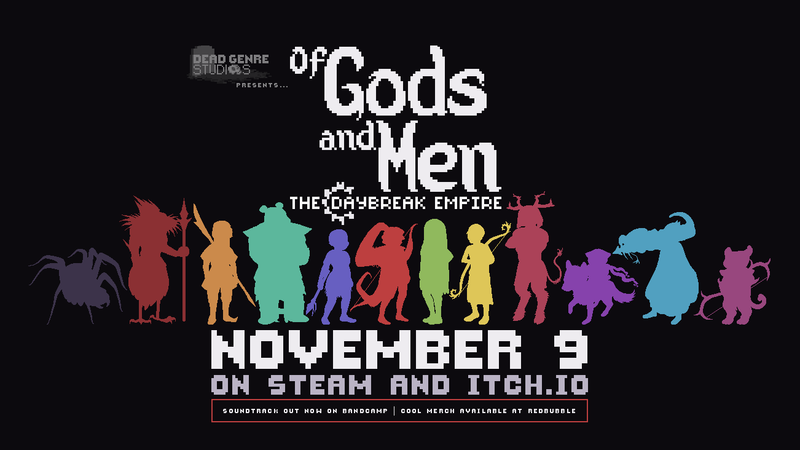 Of Gods And Men: The Daybreak Empire is set to release on November 9th 2018 for PC on Steam and Itch.io. Our retro, story-driven, turn-based tactics game will be on sale for 40% off at $4.99 USD for the first week! Please wishlist it or follow us so you don't miss it! We've also launched a RedBubble store with some cool merch and a Bandcamp page with our soundtrack!